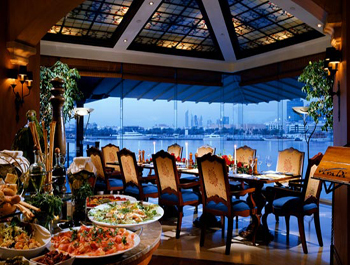 A restaurant directly overlooking the Dubai Creek, Vivaldi offers diners a combination of authentic pan-Italian cuisine and excellent service. The restaurant has a casual and light-hearted atmosphere. There is also an elegant lounge bar area, and, weather permitting, two terraces for outdoor dining offering stunning panoramic views one of the best views in town. Friday Brunch offers more than 13 international food stations including 7 live stations, with beverages as cool as the Swiss Alps. In addition there is a dedicated children’s corner with a vast choice of children’s favourite food as well as colouring-in and even movies, keeping them entertained all day long. There is not much that beats this enjoyable family filled brunch.